Photo courtesy of Braud & Co.
Long layover in Reykjavík? Make the most of it with an insider’s guide to the city — sweet treats, spectacular views, and all. REYKJAVÍK – Icelandair is known for its free stopovers in Iceland (up to seven nights) for transatlantic flights, so you’re bound to find yourself in the capital city Reykjavík on a whim and without much of a plan. You’ll be among 60 percent of the country’s entire population when you do, and you can prepare to find a little of everything — from Icelandic cheese school taught by a self-proclaimed “curd nerd” to a herring factory-turned-art museum in the old harbor. 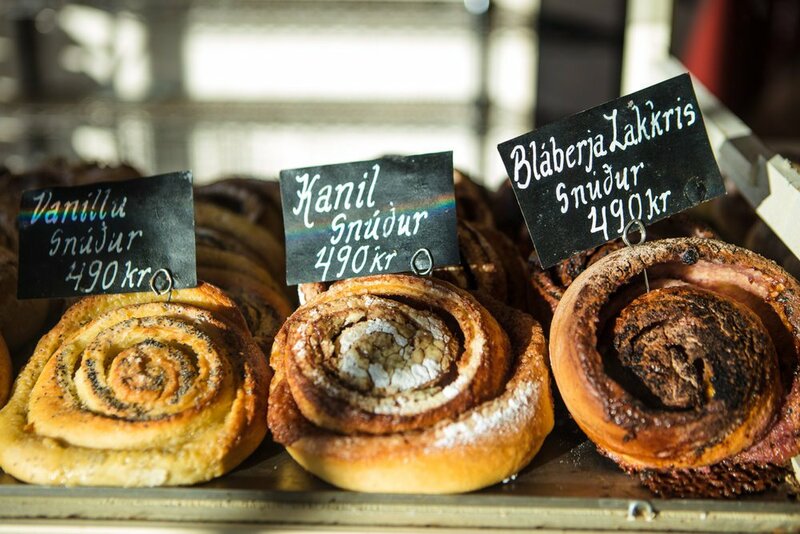 I spent a few days getting to know Reykjavík, courtesy of Promote Iceland and the Food Organisation of Denmark, and I quickly realized I needed to put the map down and just be surprised. Here are my favorite discoveries. Photo courtesy of Mat Bar. When I was researching my trip, I read that when in Iceland you should try licorice, lamb, fish, berries, and skyr. I’d like to add my favorite food groups to that list: coffee, cheese, and croissants. I started every day at the Reykjavík Roasters (formerly Kafismiðja Ìslands from renowned barista Sonja Björk Grant), just around the corner from landmark church Hallgrímskirkja. Reykjavík is actually the only Western European capital city without a Starbucks, so just embrace the hipster vibe if that’s what you want to call this place. In my book, it’s perfection, with its light and bright single-origins roasted on site, cozy window seats with views of the mountains, and fitting moody music. I skipped breakfast at the cafe and instead picked up a few pastries at Brauð & Co bakery on the next block. Follow the waft of yeast and butter to flaky croissants (for tears of joy) and pretzels (for the eventual hangover). By lunch, I’d made my way to the city’s revitalized Grandi neighborhood, where fishermen bait-and-net sheds have been converted into boutiques, restaurants, and maker studios. Grab a seat at the bar at The Coocoo’s Nest, a family-owned cafe for handmade pizzas and pastas, smart cocktails and wine, and optimal coziness. Before supper, I got my beer fix at Kaldi, a bar from Agnes Anna Sigurðardóttir, who founded Iceland’s first microbrewery located in far-north fishing village Árskógssandur (population: 100). Kaldi Bar spotlights these house beers but has also gained a reputation for its cocktail program and cavernous interiors. I had every intention of eating dinner at Hverfisgata 12, the pizzeria from the team behind Michelin-starred Dill, but I was entirely ignored by the waitstaff as a single diner, so I ended up braving the wind chill up the street to MAT BAR. Despite underwhelming service (an “Iceland thing,” I learned), it was buzzing and interesting and delicious. Being my last meal in town, I was in need of vegetables and running low on money, so I enjoyed small plates of local cucumbers, potatoes, and charred greens. 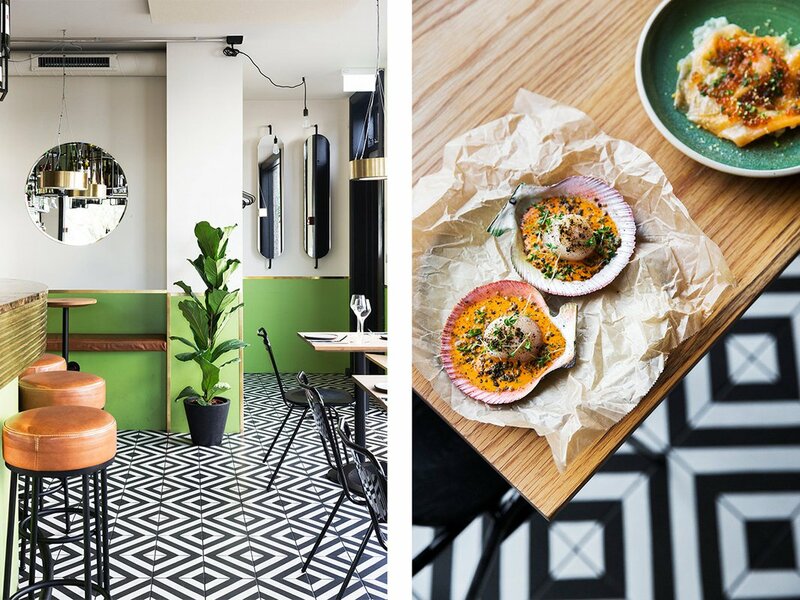 A more casual option for the night, where I enjoyed a raw chocolate cake dessert but not a meal, would’ve been the just-opened GOTT Reykjavík in my hotel, the outpost of the beloved husband-wife–owned restaurant in Heimaey, Vestmannaeyjar. Photo courtesy of Kiosk Reykjavik. Ceramics at Kirsuberjatréð and fish of the day menu at Gott. Photos by Kelsey Burrow. You can buy more than wool sweaters shopping in Reykjavík — from shoes that are works of art to ceramics — but you really should buy a wool sweater. First stop: Farmers Market (multiple locations) for modern wool clothing and goods worth every króna. My favorite store was Geysir Heima at Skólavörðustígur, the home offshoot of beloved brand Geysir, with an in-store art gallery and a roster of home and life products from various local artists and designers. 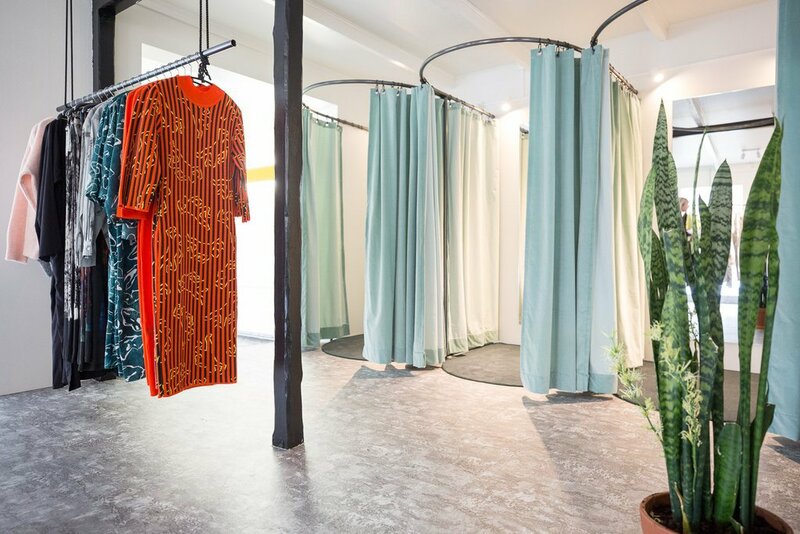 Clothing boutique Kiosk gathers the best of the best from local apparel designers, and KRON by KronKron is more of an interactive art gallery than a shoe store with masterpieces you can try on and take home. 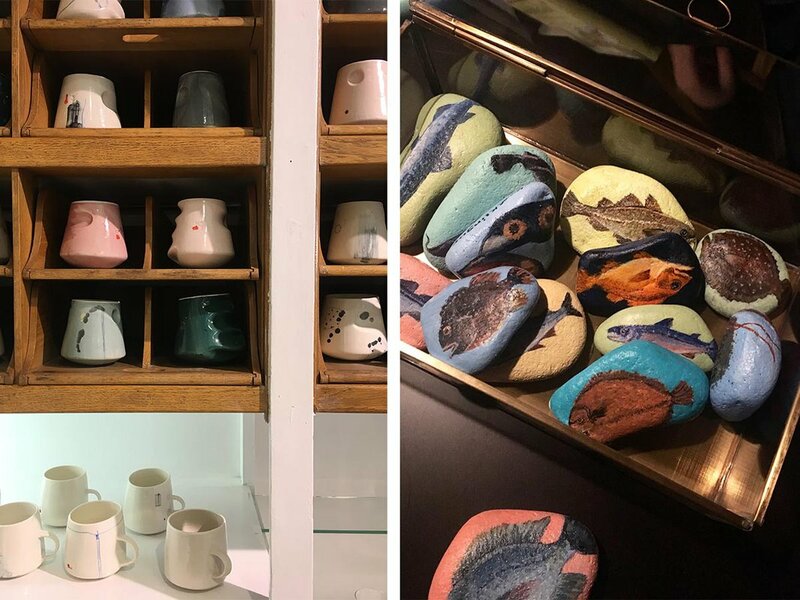 For textiles, jewelry, and quirky home goods made by local artisans, Kirsuberjatréð is a must-visit — my favorite find was the whimsical ceramic collection by artist Kristín Garðarsdóttir. Sigur Rós fans should browse the records at 12 Tónar or stop by on Fridays for live music. And for those with a sweet tooth and perhaps a humble budget, Vínberið for gourmet licorice (I opted for Lakrids chocolate-covered ginger varietal) and the waterfront Omnom Chocolate Factory & Shop in Grandi are great options. Photo courtesy of Kling & Bang. Adventure awaits beyond the city limits in wild Iceland, but there’s exploration to be done within too. I started with a run to orient myself. There’s a two-mile waterfront path that stretches from town out to the Grótta Island Lighthouse. Around the path’s terminus in Grandi, the fish factory–turned–art mecca Marshall House, a stark white, life-size version of a Monopoly hotel, is a can't-miss. 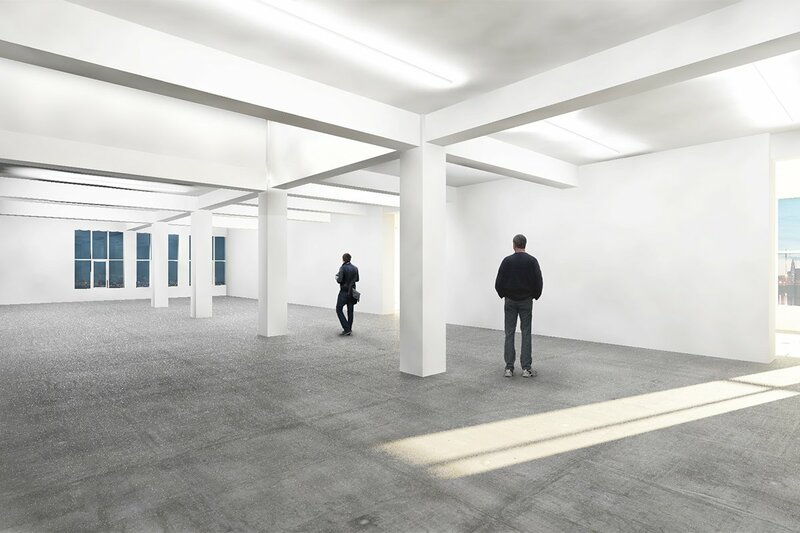 Marshall House contains The Living Art Museum, Stúdíó Ólafur Elíasson, the open-to-the-public satellite studio of the famed Danish-Icelandic artist, Kling & Bang, and a cafe, currently a pop-up restaurant from Elíasson’s sister, chef Victoria Eliasdóttir. Down the street is Búrið (meaning pantry in Icelandic), the quirky cheese shop from local food advocate Eirný Sigurarðóttir. Icelandic delicacies aren’t just limited to dairy, but the main attraction here is in the shop’s attic: the Búrið Cheese School, where students can learn about Iceland’s cheese history from the lovable, hilarious Eirný while enjoying a lunch of cheeses, breads, cured meats, salads, and sweets. Eventually, the mountains across the bay are going to call, and you must go. If you want to leave the mainland but don’t have enough time to grab a rental car, take the ferry that shuttles between Skarfabakki Pier and the uninhabited island of Viðey, which can be blissfully explored by bike or foot. (Here’s a map.) I finished my day feeling like a local at the city’s art house theatre, Bíó Paradís. Photo courtesy of Reykjavík Konsúlat Hotel. 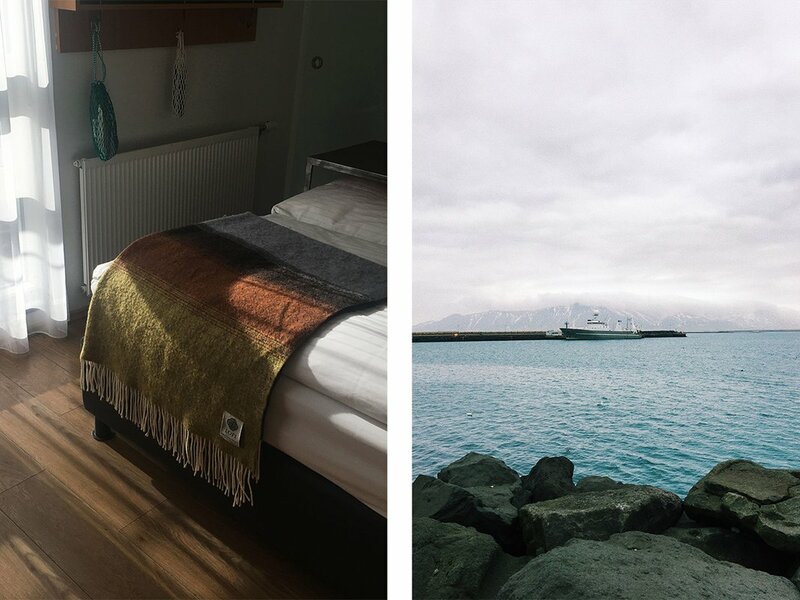 Quiet moments at budget-friendly hotel Icelandair Marina and the old harbor. Photos by Kelsey Burrow. Every layer of the just-opened boutique Konsúlat Hotel in Reykjavík’s first flatiron building tells a story. 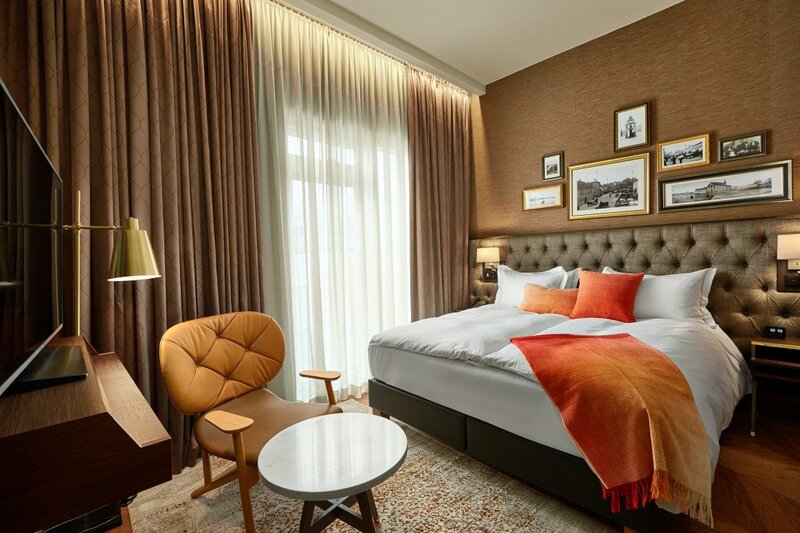 The 50-room hotel is inspired by Consul Ditlev Thomsen, who was a third-generation entrepreneur and department store owner known for establishing Reykjavík as a modern city and being a generous host, both at home and to visitors to Iceland. The lobby design is chic but eclectic — not taking itself too seriously and thus making you feel instantly at home with walls of books and a rainbow of Chesterfield sofas. Walking into my room felt like a hug with its warm rust hues and black and white Thomsen family photos. As it turns out, I was one of the hotel's very first guests — I checked in on day two of its soft opening. But judging by the service and serene state of things, you’d never know it. Alternatively, Icelandair Marina is a great budget option in a prime waterfront location between city center and Grandi. 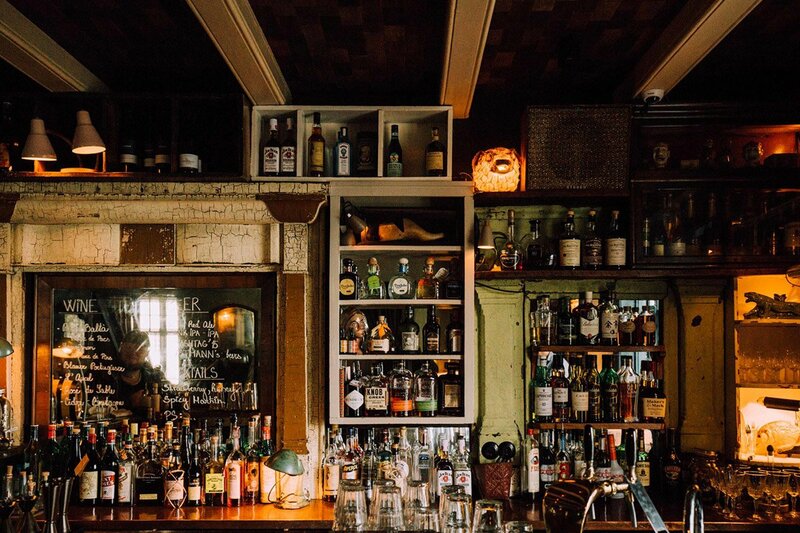 The vibe is young and fun, with a lively bar and restaurant Slippbarinn open around the clock and very willing to drown you in Negronis. Rooms are compact but just right for the active traveler, and some even have a veranda with a view.